A photograph of Mike Hayden, Assistant Secretary of Interior for Fish and Wildlife, in his Washington D. C. office. In the background, is a painting of Prairie Chickens by Wayne Willis. He was born in Atwood Kansas, and received his bachelor's degree in wildlife conservation from Kansas State University and a master's degree in biology from Fort Hays State University. During the Vietnam War, he was an infantry company commander in the U.S. Army. Hayden spent 13 months in Vietnam, where he received the Soldier's Medal, two bronze Stars, and the Army Commendation Medal. He began his career in public service as a state representative, serving from 1972 to 1986. In 1983 and 1985, he was elected speaker of the Kansas House of Representatives. Hayden was elected Kansas Governor in 1986. 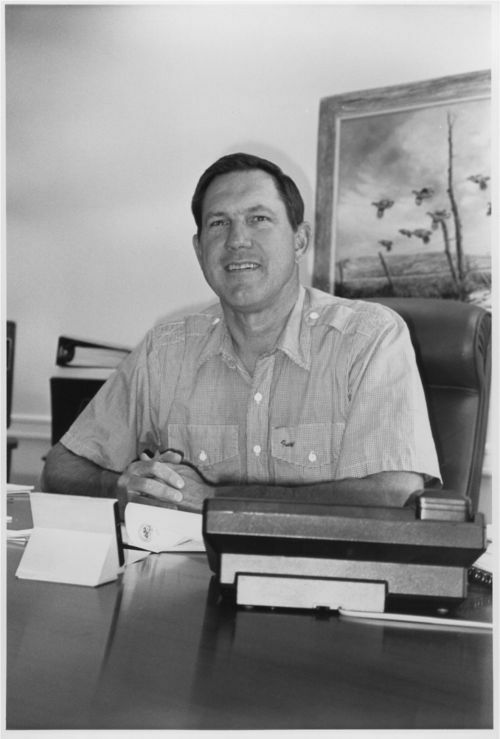 After leaving office in 1991, President George Herbert Walker Bush named Hayden to be the Assistant Secretary of the Interior for Fish and Wildlife. From 1993 to 2001, Hayden served as President and CEO of the American Sportfishing Association. In 2002, he returned to Kansas to accept a position as Secretary of Wildlife and Parks.